The first week of summer break brings to light the need for a little structure around our house. I’ve been using a new to us system for tasks and chores around the house with my older kids and it’s been really motivating for them, so I thought it might help some of you too. I’m a big proponent of kids helping out around the house and keeping a little chore list or chore chart from an early age. My kids have always enjoyed the motivation that the chore charts provide as well as knowing that they are contributing to the household. It’s a huge help for me and it will definitely help them as they get older and take on more and more responsibilities. If you’re struggling to find a system or method that works for your kids as the novelty of summer break wears off, read on to see what we’re doing around our house this summer. Note: My two older kids are 6 and 8 – they are completely capable of completing the tasks that I set up for them. Please consider your child(ren)’s age and ability level when using this and any method at your home. Kids wake up and come down for breakfast. After we eat a leisurely breakfast they head back upstairs to work through their chore chart. Chores are completed, stickers are placed on the chart, and we go about our day. If it’s a quiet day and we aren’t heading out right away, they can choose an extra chore. When the kids are doing their tasks the littlest one is typically following them around and I am cleaning up the kitchen and doing my daily cleaning routine. It’s a nice little ritual and it takes about 15-30 minutes from start to finish for us all to get our little tasks accomplished and then we continue on with our day. It’s a great system for us. We brainstormed together about which tasks to add to the list – these are tasks that are easily forgotten or that they need to be reminded of. Brush teeth, make bed, tidy room, put away dirty clothes, pick up toys, set the table, sweep under the table all made the list. Daily Task Chart: Each child has a task chart on the back of their bedroom door and they are responsible for reading the chore, completing it and adding a sticker to show that each chore has been completed. There is space for them to write their name at the top of the page too. The ‘extras’ on each week are where they place stickers from the chore jar’s completed tasks. 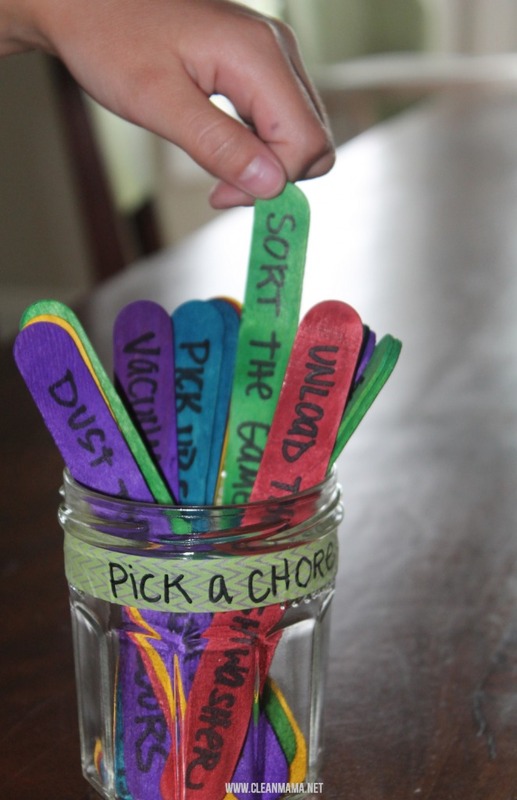 Pick a Chore Jar: If my kids want to earn extra money (25 cents/chore) they can choose a chore from the chore jar. These are simple 10-15 minute tasks that are extremely helpful for me and that they enjoy completing. If someone is bored or complaining that there is nothing to do, they ‘get to’ complete one of these tasks but they will not earn the extra chore sticker or extra money. Allowance: All the chores have to be completed to get the weekly allowance ($2). They can add up the extra chores themselves and tell us how much they earned. The money they earn is theirs: they can give, save, and spend. This is the first summer that we’re instituting an allowance – it’s not necessary but it’s motivating for them and also great for teaching them about working, earning, and managing money. Want to try this for yourself? 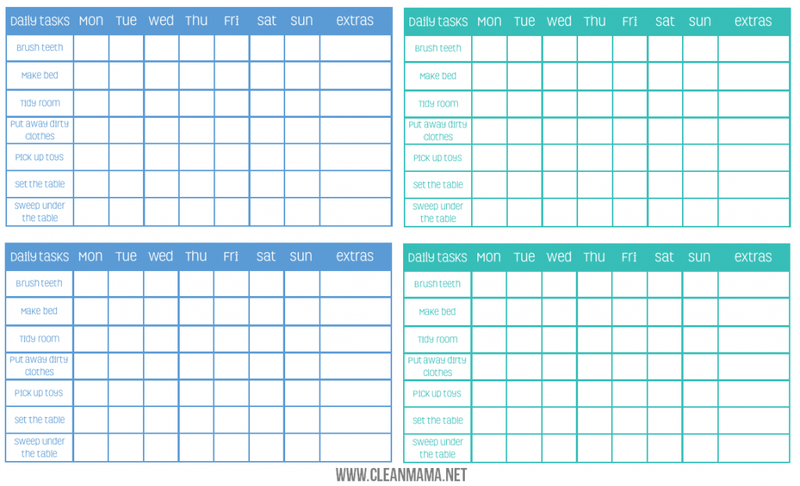 Here are a couple free printables – I made an aqua and a blue version – you can choose pre-filled with the same chores my kids complete or blank and write in your own. Happy daily task and chore charting! 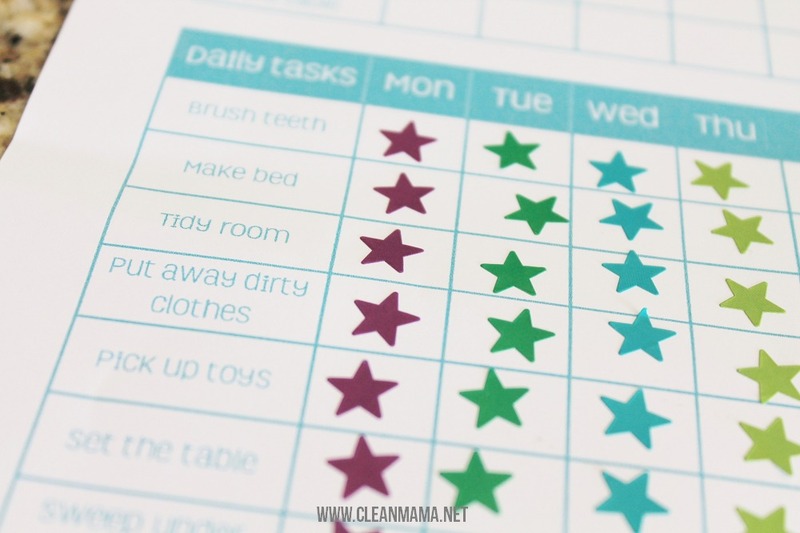 If you want a cute little picture based chart for kids, I also have a great cleaning checklist for kids. Download the zip file (all the files are included) of the free daily tasks charts here in my shop or here on googledocs. If you like these printables, you’ll love my shop, Clean Mama Printables! Thanks once again for the great free printables! I need all the help I can get! Working full time and kids in camp all day, camp clothes to wash every night and lunches and snacks to pack every day, this will help me implement some good easy chores to keep the house picked up! YAY!!!! So glad you can use the idea! Can you fix and let me know? These look great! When I go to the googledocs link all 4 files show up….you might have to sign in to google? I’ll send them to you via email too. This is exactly what I was looking for! And such a great idea. My 8 yr old is always asking how to make more money! Thanks so much for the free printables! I love this! My son has had responsibilities since he could walk; we started with him putting away his toys. It was very simple at that young age, but now – nearly 5 – he ASKS for chores! I love that he helps willingly and it’s not a struggle. I made a chore chart a few months ago for him and he loved that. Yours is much fancier, and for that I am thankful! I need these! Thank you!!! Silly question, but I’m wondering if you’d share the name of the font you used on the charts? I have a font addiction and I love this one. Thanks! 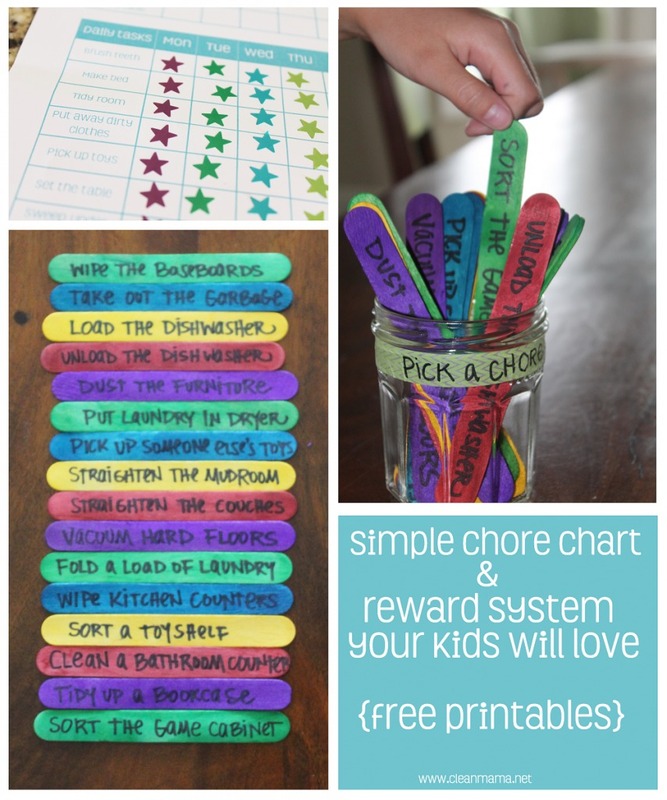 Where is the link for the chore chart free printable? Do you do this during the school year as well? Thank you! I have enjoyed cleaning this week for the first time ever. thank you so much for shearing you ideas. 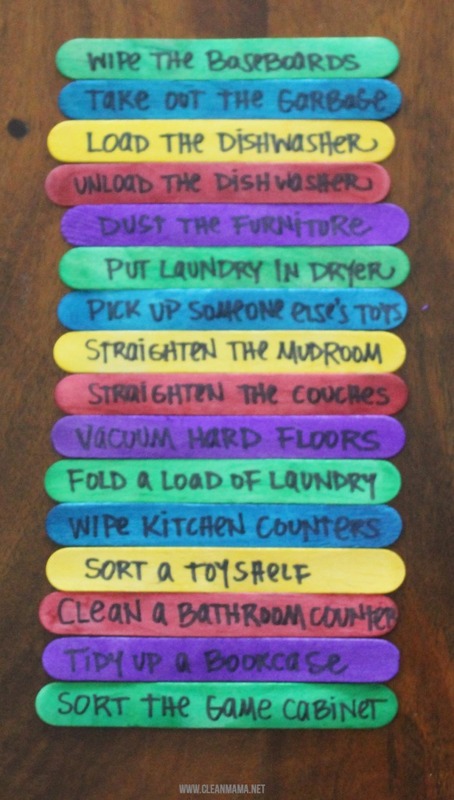 This is such an awesome chore chart! I think that parents would love these, and I love the fun colors of the sticks as well. I’m going to share it with my readers too! Love this idea! How many do they do in one day? Whats required? Or can they do as many as they want? Thank you for the help and great ideas! 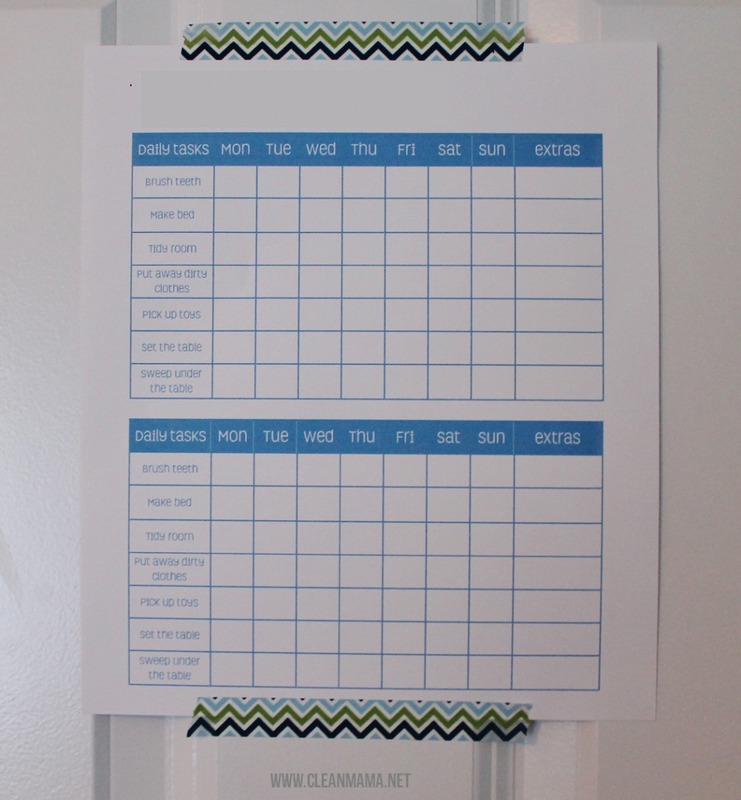 Is there a free blank printable chore chart? Thank you so much! I just love this idea! I featured it on my Summer Survival Tips post here: http://www.mommade.org/2015/06/summer-survival-tips.html. Thanks so much for sharing! This may seem like an odd question, but I was wondering if you can tell me the size of the jar you use or where you got it? Thanks! We go back and forth between allowance and treats 🙂 It’s always on a weekly, not daily basis.